Tuesday April 25th from 3.30 pm, at Hippodrome of Visarno – Parco delle Cascine , Firenze – it will take place the competition 190° Horserace of Arno and it will be possible to take part to the contest “THE MOST BEAUTIFUL HAT FOR CORRI LA VITA”. 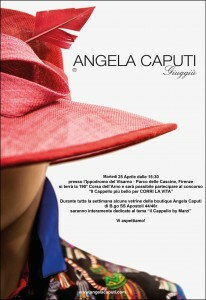 On occasion, during the week, the shop window of the boutique ANGELA CAPUTI Giuggiù in B.go SS Apostoli 44/46r, will be totally dedicated to “The hat by Marzi”. We look forward to seeing you!